Joyce Cousseins-Smith was the hero for Calais with her coolness from the free-throw line during money-time with 6-from-6 for her side to hold off Aix-en-Provence (81-75). Armentières fell short at home to Lattes Montpellier (60-71), while Arras were taken all the way by Toulouse before coming away with the win (76-70). Challes-les-Eaux puffed and huffed their way to victory against Limoges (79-66). Nantes-Rezé required double overtime to beat Basket Landes (77-74). Tarbes played their match on Sunday against Villeneuve d'Ascq and with this road victory (81-77) stay number 1 in the LFB standing. Tarbes remain top of the LFB after a hard fought victory against Villeneuve. Isabelle Yacoubou-Dehoui who has been making all the basketball news headline for her different hair styles led the Tarbes attack with 22 points and 9 rebounds. She also fired 2 shots from beyound the arc. Her battle with Lady Comfort from Villeneuve d' Ascq was one of the key encounters of the match. Anna Breitreiner and Frida Eldebrink scored 20 and 17 points each, while Charde Houston contributed 10 points in the (81-77) victory. The basketball news at Villeneuve was about the health of Jolene Anderson who missed her side's last EuroLeague game. She was back for this game and contributed 11 points. But it was the performance of Lady Comfort with 20 points, 13 rebounds and 3 steals that kept the home side happy. Elodie Bertal and Emilie Gomis came up with 14 and 12 points each. Villeneuve had no luck from behind the arc with just 1-from-17 although they won the rebound battle. Both teams started strong defensively which made scoring practically impossible during the first five minutes (2-2). Jolene Anderson ended the drought with a put-back after collecting an offensive rebound. 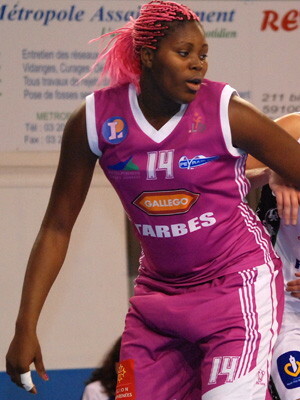 Isabelle Yacoubou-Dehoui replied almost immediately from the free-throw line. The two teams traded baskets with Villeneuve d'Ascq edging the first quarter (16-14). 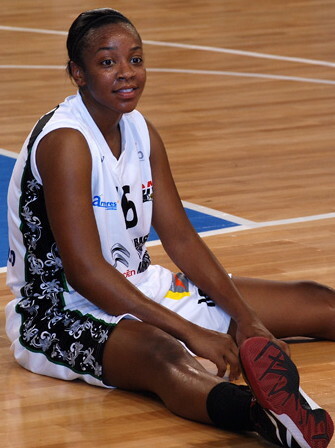 Former Villeneuve player Fatimatou Sacko opened the scoring in the second quarter to bring the teams level. She followed this up with a block on Anderson. Both players shared a smile then got back to action. Elodie Bertal and Emile Gomis scored for the hosts. But each time Yacoubou-Dehoui replied for Tarbes. However Bertal continued to cause the guests problems for her side to open the first lead of any significance (26-21). This resulted in François Gomez calling a time-out. Yacoubou-Dehoui has been attempting three-pointers all season and finally hit one from behind the arc to the dismay of the home supporters. A second trey by her was quickly followed with 2 points by Charde Houston for Tarbes to go back in front (29-28). Gomis and Ingrid Tanqueray picked up the pace for Villeneuve to regain the lead. They went 3 points clear after a pair of free-throws by Laurie Datchy. The advantage did not last long because Yacoubou-Dehoui (16 points in the first half) continued her one-lady demolition of the guests with a 3-point play (2+1). 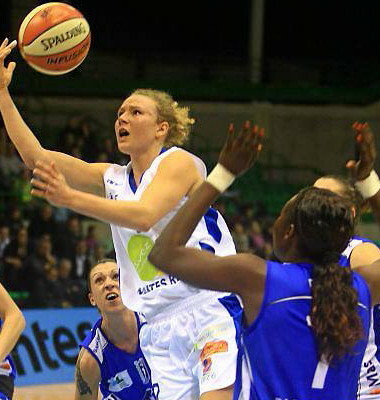 Anne Breitreiner scored back to back baskets for Tarbes to go ahead at the interval (38-36). Lady Comfort scored quickly after the break for the hosts. Tarbes responded with Breitreiner scoring 5 points. The two teams continued to play quickly and Villeneuve regained the lead again (46-45) after a 3-point play (2+1) by Tanqueray with 2:30 played in the quarter. 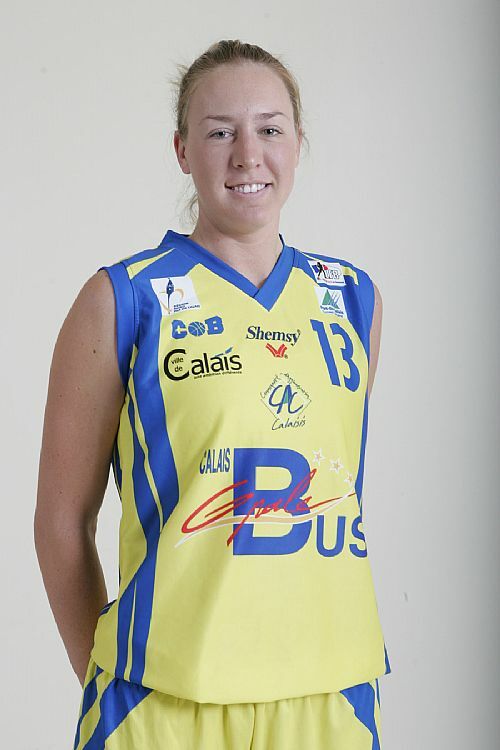 Frida Eldebrink hit her first three-pointer of the match to put Tarbes back into the driving seat. Isis Arrondo (left) and Yacoubou-Dehoui added 2 points each as Tarbes went 6 points clear (52-46). Adbou N'Diaye called for a time-out to stop the leakage. Comfort continued her battle with Yacoubou-Dehoui and managed to score for Villeneuve. Yacoubou-Dehoui was quickly down the other end to score and draw a foul. She missed the free-throw. But 30 seconds later Elderbrink was left open from behind the arc to hit the trey (57-48). Villeneuve were not able to break their opponents' defense and were caught sleeping on the fast breaks of Tarbes. Arrondo completed a 10-0 run with a trey. Ana Cata-Chitiga ended the barren spell for the hosts. Yet another three-pointer by Eldebrink enabled Tarbes to lead (63-51). Villeneuve were having no luck from beyond the arc. However they were able to keep Tarbes quiet thanks to some impressive defending by Comfort. After 13 attempts hitting from behind the arc by Villeneuve, Datchy connected to start a run for her side as they reduced their deficit (63-67) to 4 points. Eldebrink fired in another three-pointer for Tarbes to maintain control for her side with back to back baskets from Breitreiner (74-66). Gomis and Anderson stepped up for Villeneuve while Comfort continued to play wonders in defense. With 90 seconds left to play they trailed by 2 points (74-76). Eledebrink hit a jump shot just from just outside the paint. Gomis replied almost immediately as the game went into the last minute with Tarbes holding onto the lead (78-76). Villeneuve were not able to score from behind the arc and the rest of the game was played out on the free-throw line with Tarbes winning that contest 3-1 to win the match (81-77). Limoges ABC's point guard issue was in all the basketball news in France recently. They have solved the problem by signing Greek international Aikaterini Spatharou (left) last week. She made her début for the club this weekend and finished with a statistic line of 7 points, 3 assists, 1 steal and provoked 5 fouls in 38 minutes. Not only Spatharou’s presence made a big difference to Limoges’ play. It was also their free-throw shooting which kept them in the game (20-from-20). However they lost the battle of the rebounds due to foul problems of their inside players. Erica Davis managed only 16 minutes after picking up 2 fouls early in the first quarter. She still managed to score 10 points and pick up 6 rebounds during that time. Kerline Verjuin (8 points) was not so lucky and fouled out with just 12 minutes played while Laima Rickeviciute finished the game with 4 fouls and 6 points. Challes-les Eaux picked up a total of 36 rebounds of which 14 were on the offensive end. All the same Limoges played their hearts out to go into the final quarter ahead (59-57). They soon stretched the advantage to 5 points and led (64-59) before the pendulum changed directions. The Challes-les-Eaux duo of K. B. Sharp (16 points) and Kirby Copeland (19 points) went to work offensively. The teams were soon level (64-64). The guests had taken the lead (67-66) with five minutes left to play and kept Limoges scoreless to the end of the game to win (79-66). Magali Lacroix from Challes who was also hampered by foul problems scored 16 points. For Limoges Awe Geye led the scoring with 18 points while Elodie Chieze added 14. Armentières have to stop allowing teams a head start. This weekend they allowed their guests from Montpellier, who did not play well, to open up a double-digit lead in the first quarter. This advantage was enough for Montpellier to then pace themselves to victory (71-60). In the first quarter Armentières committed too many fouls, shot the ball badly (5-from-15 attempts) and took 7 minutes to get going. Montpellier exploited the foul problems of their opponents to score 6-from-7 from the charity stripes to go 10 points clear (20-10) by the end of the first quarter. Armentières had their moments during the second quarter and reduced their deficit by half time to 6 points (34-26). Yet the game never took off. Montpellier regained control of the game after the break and had a maximum advantage of 17 points and went into the final quarter leading by 15 points. There were no miracles for the hosts during the last ten minutes as they allowed the game to escape them. Pauline Krawczyk led the Montpellier attack with 14 points, while Dana Boonen and Constance Jinks scored 13 points each. Alexia Plagnard finished the game with 10 points. Mia Fisher and Marie-Frédérique Ayissi scored 16 and 13 points each for the hosts. If only Aix-en-Provence could find a solution to their foul problems: Giuday Mendy fouled out of the game at the start of the final quarter. They also lost Julie Page (14 points) during money-time. In addition Tiffany Stansbury (12 points) played the last seven minutes with 4 fouls. Furthermore Ivona Matic was not able to play. On the other had, Calais' basketball news has been positive recently with victories also for the youth teams. Calais had the best of starts to the game with Elizabeth Engell scoring the first 5 points of the game. Lauren Neaves soon joined in the action and Calais led by 10 points with just under nine minutes played. Engell and Neaves scored 8 and 7 points each by the end of the quarter with Calais leading (23-14). Aix' long distance shooting enabled them to reduce their deficit slightly by the interval (36-41). When Calais scored 11 unanswered points to start after the break (52-36) they appeared to have the game secured (62-46) by the end of the third quarter. With just under four minutes to play Calais' advantage was still 15 points (72-57). By the time the game was in money-time Aix were just 9 points down (66-75). Page fouled out fouling Jennifer Humphrey, who then missed both free-throws. Cyril Sicsic started to look worried after Claudia Das Neves scored to make it a 7-point game with 80 seconds left to play. In order to stop the game clock, Margaux Okou Zouzouo (14 points) fouled Joyce Cousseins-Smith (21 points) quickly after Das Neves had scored. The lady from Calais kept her cool and scored from the free-throw line. She was to make two more trips to the foul line and score on each occasion. This cancelled out the late scores of Okou Zouzouo for Calais to win (81-75). Neaves and Engell finished with 20 and 18 points for Calais while Das Neves finished on 18 points for Aix. Arras' defeat last week to Nantes-Rezé came as a surprise. So the question asked this week in the regional basketball news section was what was next for Arras? Toulouse are not an easy team to manoeuvre at home. This match was seen as a perfect test if Arras has what it takes to contest for the title at the end of the season. Arras had a good start and led (24-17) by the end of the first quarter but trailed (36-37) at the interval. Sarah Michel (11 points and 7 steals), who had been quiet for a few games, was very active in this game. She started the Arras fightback late in the third quarter with a trey as her side outscored their hosts 7-2. This run was concluded by a trey by Leilani Mitchell for Arras to lead (55-54) going into the final quarter. Toulouse failed to regain the lead again although drawing level (60-60) through Leah Metcalf (15 points) with 7:30 left to play. Mitchell's 5th three-pointer of the game put Arras in the lead for good. Toulouse had no luck from beyond the arc with 1-from-12 and were unable to close the gap. They ended up losing (70-76). Mitchell was the player of the match with 19 points, 4 assists and 9 rebounds. Olesia Malashenko scored 13 points while Johanne Gomis joined Michel on 11 points. 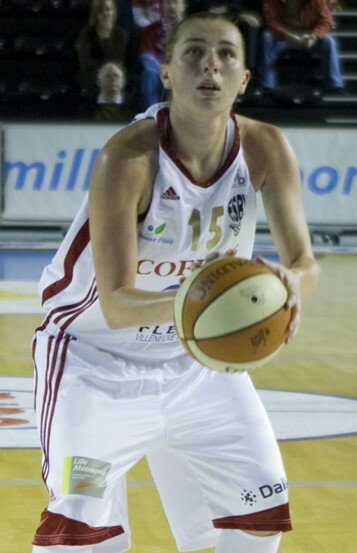 French international Emmanuelle Hermouet led the Toulouse attack with 18 points and while Emilie Maurice added 13 points. A team coached by Laurent Buffard winning five straight games does not get into the basketball news because this had been something he had done regularly while coaching USVO. However Nantes-Rezé beating Basket Landes is a major headline.You have to go back by five years for the last time Nantes-Rezé had beaten Basket Landes in an official game. Nantes required 50 minutes to get past their bogey team (77-74) in what was a crazy match with so many plots and twists. Nantes-Réze edged the first quarter (14-6). After 14 minutes they led (23-9) and went into the locker room ahead (34-24). Basket Landes were stronger after the break. The two teams were level (38-38) within five minutes of the third quarter. Both sides played cat and mouse for the rest of regulation time and finished level (61-61) and then (69-69). In the end a three-pointer by Yuliya Andeyeva and a couple of free-throws by Doriane Tahane was enough to separate the teams. Mame-Marie Sy-Diop (5 steals) was on the court for more than 47 minutes and compiled a double-double of 12 points and 16 rebounds. Kathleen MacLeod was the only player who never came off. She scored 16 points and dished out 9 assists. Leslie Ardon who is the captain contributed 14 points. For Basket Landes Aja Parham also compiled a double-double of 15 points and 11 rebounds. She also had 5 assists to her name before fouling out during overtime. 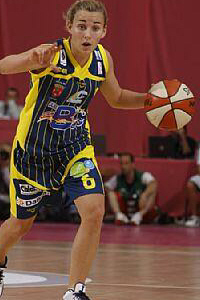 Sabrina Reghaïssia also scored 15 points.